Quantum - BHHAA-EY BHHAA-EY Quantum 40 80GB DLT Vs80 SCSI LVD Internal HH Tape Drive. New Bulk Pack. IBM - 24P2431 DLT VS80 40 80GB LVD SCSI INT. Seagate - ST3146855LC SEAGATE - CHEETAH 146.80GB 15000 RPM 80 PIN ULTRA320 SCSI HARD DISK DRIVE. 16MB BUFFER 3.5 INCH LOW PROFILE (1.0 INCH (ST3146855LC). IN STOCK. SHIP SAME DAY. Hewlett Packard - C7483A C7483A HP Surestore DLT1e 40 80GB Full High Low Voltage Differential Single Ended SCSI External Tape Drive. New Bulk Pack. 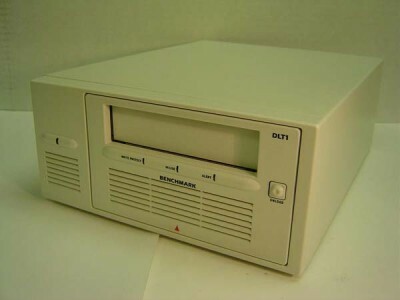 Dell - 2T713 2T713 Dell 40 80GB Vs80 Internal LVD SCSI HH Tape Drive. New Bulk Pack. Hewlett Packard - DLT1 DLT1 40 80GB SCSI LVD SE HP SureStore INT. Benchmark - DLT VS80 DLT VS80 40 80GB LVD SCSI INT. Dell - Y6643 Y6643 Dell 40 80GB Powervault 122t DLT Vs80 SCSI LVD RM V3 Tape Autoloader. New Bulk Pack. Hewlett Packard - C5725A C5725A HP Surestore DLT 80i 40 80GB Low Voltage Differential SCSI Internal Tape Drive. New Bulk Pack. Hewlett Packard - 146198-008 146198-008 HP 40 80GB DLT8000 SCSI LVD Se Internal FH Loader Ready Tape Drive. New Retail Factory Sealed With Full Manufacturer Warranty. Hewlett Packard - 231823-B21 231823-B21 HP 40 80GB MSl5000 DLT8000 SCSI Internal Low Voltage Differential Loader With Tray Msl Series. New Bulk Pack. Hewlett Packard - 231669-001 231669-001 HP 40 80GB DLT8000 SCSI LVD Loader Msl Series. New Bulk Pack. Hewlett Packard - 154873-002 154873-002 HP 40 80GB DLT8000 LVD SE Wide SCSI Loader Library Ready Tape Drive. New Bulk Pack. Hewlett Packard - 280279-002 280279-002 HP DLT Vs 40 80GB Low Voltage Differential Ultra-2 SCSI External Tape Drive. New Bulk Pack.